Think about your company. If it’s like the majority of businesses today then you probably use a handful of SaaS (software-as-a-service) products or are thinking about taking the plunge. SaaS has blown up over the last decade. Whereas prior to the 2010s companies were not placing significant value on cloud-based programming and relied instead on in-house applications, this is not the case anymore. Now, SaaS technology is here to stay and is an integral part of the B2B and B2C industries. Though you are using SaaS platforms for your applications, it’s still essential to have a developer on staff. However, you may be wondering if a developer in-house or one outsourced is more suited to your business’s needs. SaaS is a cloud-based system of software that allows a business to pay a subscription fee to use software that another company maintains and hosts, rather than installing, hosting, and maintaining it yourself. Generally, SaaS is on a pay-as-you-go model that offers automatic updates and different levels of usage. Businesses rely on SaaS vendors to provide the software, tracking and reporting, and general upkeep. Many companies have been hesitant to go with a cloud-based model of software due to cyber security fears. Cyber security is important for businesses which has made many companies hesitant to go with an SaaS cloud model, instead of having an in-house developer. However, these fears are largely unnecessary. Because of the security necessity in cloud environments, developers build systems that have security as a main function. Because SaaS providers deal with multiple clients at a time, security has to be their highest priority. A security breach into a provider would prove to be disastrous to them and their clients, so security is always a top priority. Other benefits of using SaaS providers instead of in-house development include: a lower upfront investment, short implementation times, and minimal training needs. You’ve invested in SaaS applications, now what? Whether you’ve been invested in SaaS applications for a while or are just getting started, having a developer on hire is essential to any business’s success. It’s important that you have someone that understands software and how to integrate it into your company. When your website is down, your company is down. 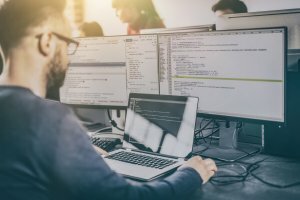 If you don’t have a developer who understands the intricacies of your company and its software and what to do if something fails, this can result in a massive loss of income and your overall trustworthiness and reputation as a business could go down. With that said, many companies struggle with the decision to hire a developer to have on staff or if they want to outsource a developer through an agency or a freelance website. There are pros and cons to either option you choose and we’ll break it down for you so that you are able to make an educated decision. Of course, having a professional on staff does make some aspects of the job easier. There is always someone there to communicate issues, attend staff meetings, and handle the day-to-day minor issues that crop up. Another perk with an in-house developer is you cut out the middleman. Your developer and SaaS vendor are able to work together without going between an outsourced vendor that may or may not be immediately available. Your long-term vision may be more easily recognized by someone who is there on a day-to-day basis and that’s not something to be ignored. Having an employee who is an active and invested part of your company brings value that may not be achieved through an outside hire. While there are pros to having an in-house developer, the benefits of outsourcing development help cannot be overlooked. There are obvious benefits to not hiring a full-time staff. Generally, you need more than one developer on your team. This is costly when you add in the hiring process, health benefits, paid vacations, and matching the industry standard pay (which ensures a quality employee). There’s paid training to think about in addition to the normal costs developers will need to have in order to stay up-to-date on the latest tech updates. Often times there needs to be a link between SaaS platforms and the companies who are using them. If you are purchasing a lot of SaaS products, then an in-house developer may not be the best option. You need a dedicated vendor that has experience connecting all the different aspects of your softwares. You may also be wondering about hiring a freelance developer versus hiring an agency. With a freelance agent, you’ll run into some of the same issues than if you had hired someone in-house. While freelancers are on a contract and you won’t be paying for benefits, just one developer may not be able to weave together all of your software platforms together. 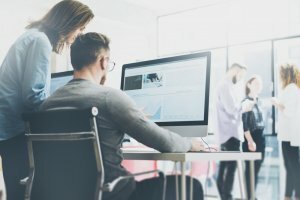 Outsourced development vendors will have the tools available to connect the SaaS software, whereas freelance and in-house hires will take more training, time, money, and leadership. Generally, one developer will not be enough to combine all of your SaaS products together. In this case, you’ll need a lead developer, in addition to at least one other hire. Hiring an agency that specializes in web development will be the safest option for your business. The knowledge that comes with a developer who works with a handful of clients and has experience in multiple software programs will be an essential part of your business’s success. Now that you’ve seen the benefits and drawbacks of in-house developers versus outsourced developers when you’re using SaaS providers, you’ll be able to make an educated decision to benefit your company. Hiring an in-house developer adds ease to day-to-day tasks and small upkeeps. Outsourcing ensures that you have a team of developers who know how to weave all of your platforms together into a cohesive unit. If you’d like a free 30-minute consultation from Pro Q to discuss your development needs, please contact us here.